This post was written by Chris Gilliard and originally published on January 31st 2017 on his blog at hypervisible.com. Chis is a professor at Macomb Community College and serves as an advisory buddy for Virtually Connecting . As I arrived home from my weekend attending Educon 2.9, I ran into the remnants of the airport protest in my city, part of the nation-wide response to the Executive Order banning Muslim immigration. 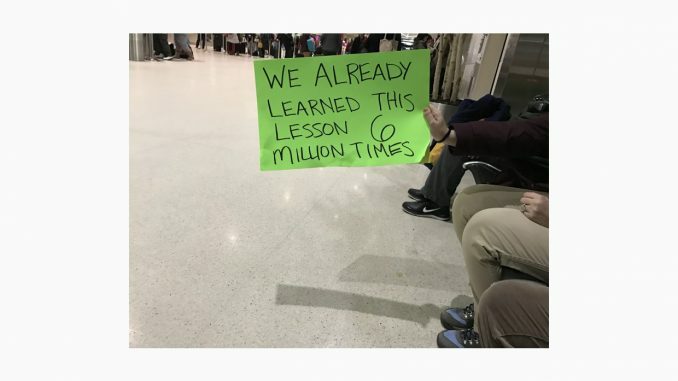 One of the protest signs read “We already learned this lesson 6 million times.” Unfortunately, it seems that many of us did not learn that lesson well enough, and we will need as many voices as we can get to speak out against injustices. Many of our students are ready to offer the voices that we need. “Student voice” is one of those terms that I hear all the time, but rarely do I see it put into action, and when I do, it’s not the voices of the kinds of students I teach. Rather, it’s students from Ivy League institutions or students with tremendous privilege. Let’s get this out of the way: I’m not saying we shouldn’t hear from these students, I am simply saying we shouldn’t only hear from these students, or these students shouldn’t be looked at as representative of “student voice” when (as of 2014) 42% of all college students are community college students, and these students are disproportionately low-income. I make this last point about millennials because all of us attended Educon in the shadow of the fallout from the Executive Order. While this generation is getting hammered for being awful, the generations before them are the ones busy wrecking the planet. This weekend was filled with moments of pride and inspiration as I watched students take command of their intellectual path, interspersed with moments of disgust as I watched the bigotry and hatred some of our leaders and the cowardice of others, and finally an infusion of strength as I watched people turn out to demand that those in power recognize our shared humanity no matter what nationality or religion. What do these all these things have to do with each other? Everything I know about my students, I learned about them from talking to them, spending time with them, and reading their work: not from a dashboard, readout, or spreadsheet, or for that matter, not from the latest garbage hot take about how awful today’s young people are. In the age of DJT, I’ve read a lot of proselytizing about what we as teachers can do or need to do. Among the many things reaffirmed for me by my students this weekend: good teaching doesn’t scale. If professors, teachers, instructors have any role in helping prepare our students to clean up the mess we’ve made and continue to move towards a more just world, we need to do a better job of finding out who they are and what motivations shape their world.